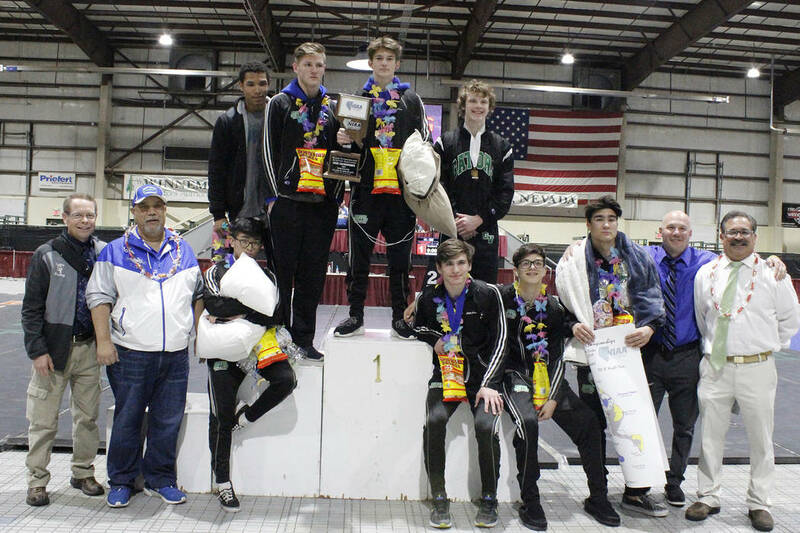 WINNEMUCCA — Spanish Springs held off Green Valley on Saturday to win its second consecutive Class 4A state wrestling championship. The Cougars defeated the Gators 139½-129. Shadow Ridge was third at 121½, and Cimarron-Memorial (108) and Spring Valley (76) rounded out the top five. Spanish Springs had three champions in Devin Griffin (113 pounds), Anthony Sissom (138) and Colby Preston (195). Sissom beat Spring Valley’s Andres Garcia in triple overtime. Green Valley had four champions in Steele Dias (120), Will Zernich (126), Justus Scott (160) and Desmond Bowers (170). Zernich cruised in his final, defeating Shadow Ridge’s Triston Curtis 13-2 for his second consecutive title. Matthew VanRiel from Shadow Ridge won at 132 pounds, defeating Cory Sego of Spanish Springs 7-2. Spring Valley’s Ryan Mitchell captured the 106-pound title, beating Bishop Manogue’s Carter Tate by pin in 58 seconds. Cimarron-Memorial’s Daniel Rodriguez defeated Durango’s Kaden Renshaw 4-3 to win at 152 pounds. Faith Lutheran’s Connor Bourne became a three-time champion with an 8-4 victory over Carson’s David Remer at 182 pounds. Liberty’s Nate Hendricks (220) and Basics Julio Duron (285) also won state championships. In the Class 2A tournament, Pershing County won its first state wrestling championship and stopped Battle Mountain’s run of six straight state titles. The Mustangs beat the Longhorns 209-173½. Yerington was third with 154½ points, followed by Pahranagat Valley (68) and Tonopah (64½).